Seattle will install smart signals in South Lake Union next year so green lights continually adapt to arriving traffic, meaning less wasted time for drivers. Seattle’s rebuilt Mercer Street, gateway to the knowledge economy, should finally wise up next year — using new signals that continually read traffic and re-time their green lights. They can’t cure the thickest 5 p.m. gridlock, when there are too many cars, pedestrians, trucks and streetcars to give everybody a clear path. Bryan Mistele, CEO of the Kirkland-based INRIX traffic-data firm, discusses the benefits of better traffic-signal timing and driverless cars. Read more about this conversation on traffic solutions. But for most of the day, drivers will see longer strings of green lights, and waste fewer seconds idling, when they travel crosstown. “Adaptive signals,” already at work in Bellevue, have proved especially effective at semi-congested times, before and after the peaks. If drivers have shorter waits for a green light at 3 p.m., cars flow out of the way and stop-and-go traffic might not accumulate until 4:30. 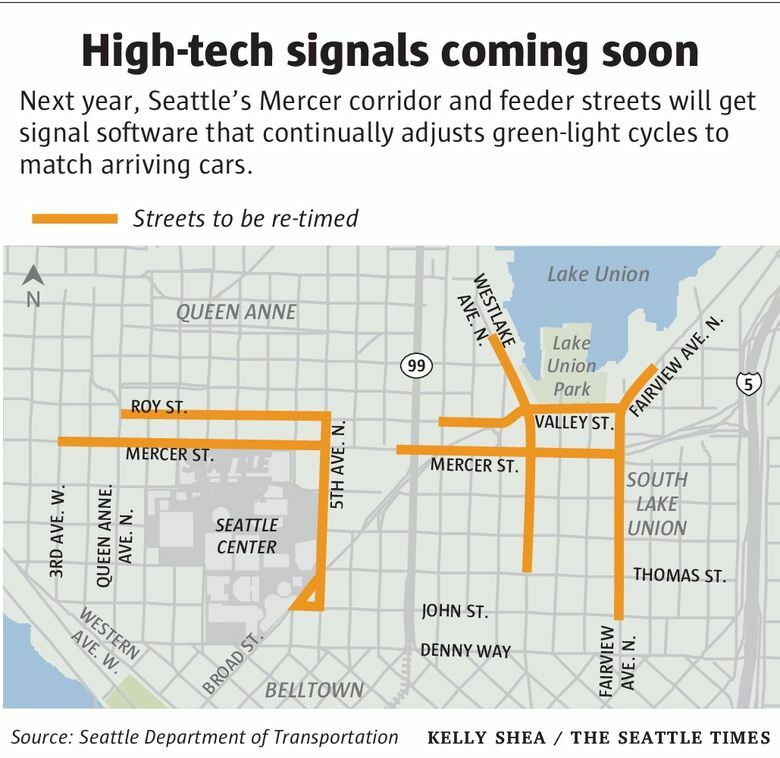 Mercer Street is the first of five corridors a year where Seattle promises to install either adaptive signals or other kinds of signal re-timing, in the next nine years. Bellevue has already outfitted 197 intersections with adaptive signals. Seattle’s venture is to be funded by $13.1 million from the just-approved $930 million Move Seattle property-tax levy, though $1 million to improve Mercer was already budgeted. “We can’t build lanes fast enough, so milking more capacity out of the roads we have is the way to go,” said Marni Heffron, a consulting traffic engineer and expert on South Lake Union. Future candidates include Denny Way, 23rd Avenue, Northgate Way Northeast, waterfront Alaskan Way after the viaduct is demolished, First Avenue South and Fourth Avenue South in Sodo. The city is not yet predicting how many seconds travelers can save but soon will be doing research and simulations. Most of these streets are near freeways, sporting events or festivals that produce rapid changes in car volumes, making them ideal for adaptive traffic signals, said Mark Bandy, traffic-operations director for the Seattle Department of Transportation. Meanwhile, about 300 signals downtown will be retrofitted and re-timed next year to tailor their response in 12 zones. They now run strictly on the clock. They lack even magnetic car-detecting loops in the pavement, which have been common for a couple of decades. The improved downtown signals won’t continually adapt, as on the Mercer corridor, Bandy said, but they will occasionally re-time themselves when traffic patterns abruptly change. Mayor Ed Murray proposes to reduce the 30-mph downtown speed limit to 25 mph for safety, which would require a City Council vote to change the traffic code. That shouldn’t affect re-timing, since traffic usually runs under 25 mph already, Bandy said. Nationally, adaptive signals exist at fewer than 1 percent of intersections, says the Federal Highway Administration. A project on Los Angeles boulevards reduced overall trip time 10 percent, Bryan Mistele, CEO of the Kirkland-based INRIX traffic-data company, said at a recent Seattle Times LiveWire forum. On a busy Friday morning, engineers inside Bellevue’s traffic-control center watch a string of green lights welcome motorists on 148th Avenue Northeast, near Microsoft. “The congestion doesn’t start as soon, and the congestion doesn’t last as long, with a system like this,” said Mark Poch, Bellevue assistant director for traffic management. Most vehicles didn’t need to make a complete stop at 8 a.m. As volumes grew, the signals’ software gave six extra seconds of green to the dominant north-south corridor, by stealing six seconds from the cross streets, out of the total 150 seconds Bellevue allows per cycle. When traffic is lighter, the software condenses the cycle by 20 to 50 seconds midday, so drivers spend less time waiting for the next green light. Bellevue drivers are saving a half-million hours per year, so if someone’s time is worth $15 per hour, that’s a $7.5 million public gain, said Raid Tirhi, senior city traffic engineer. “The signals are the highest cost-benefit investment the city has made during my tenure,” said City Council member Kevin Wallace, elected seven years ago. Poch said adaptive signals along Factoria Boulevard Southeast cut travel times 36 percent — for a while. “We reduced a lot of congestion. The cars came back and filled it up,” he said. The most expensive technology can read pedestrians, but isn’t on order in Bellevue or Seattle. So people on foot need to bang the so-called “beg button” to interrupt the car-centric algorithms. In the case of Mercer, they will secure a full 31 seconds to ford seven lanes and the median. Most days, the delays around Mercer overflow onto Interstate 5, creating not just regional congestion but crash risks. If adaptive signals perform well, the typical 7 a.m. queue to exit I-5 might not materialize until 7:45 a.m., said Mark Hallenbeck, director of the Washington State Transportation Center at the University of Washington. There still will be a backup, “but on most days it will be shorter than you experience now, and will be gone sooner,” he said. New city data say cars needed an average 18 minutes to crawl the 1.7-mile length of Mercer from Interbay to I-5 in September between 4 and 8 p.m. — with a range of 13 to 23 minutes. Adaptive signals will make the time it takes for the drive less volatile, Bandy hopes. Thousands of people commuting home from their e-commerce, cancer-research and global-philanthropy jobs won’t necessarily sense improvement at the slowest times. “The fact that you are still not moving consistently down Mercer will likely dominate your view of the situation,” Hallenbeck cautions. Nonetheless, there’s value in saving moments throughout the day, Heffron insists. “If I were to add up all the people who travel from 10 a.m. to 4 p.m. who will benefit from adaptive signal control, it will probably benefit more people than travel at the peak,” she said. And even for those unlucky 5 p.m. drivers, said Hallenbeck, they might miss only two green lights due to gridlock ahead, rather than four.